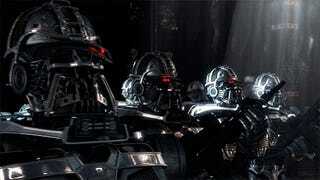 Troubled Battlestar Galactica spinoff Caprica has been nuked by Syfy. Not only will the show not be getting a second season, the remaining episodes of this season won't be aired until next year. Syfy announced that the remaining episodes, starting with the one that would have aired next week, will be shown in early 2011. This is horrible news for fans of the show, which was just reaching fever pitch with last night's episode. Unfortunately, the show's fans were dwindling rapidly, with the most recent episodes reaching less than 1 million viewers. We appreciate all the support that fans have shown for Caprica and are very proud of the producers, cast, writers and the rest of the amazing team that has been committed to this fine series. Unfortunately, despite its obvious quality, Caprica has not been able to build the audience necessary to justify a second season. Last week, Syfy announced it would be starting work on a BSG prequel show called Battlestar Galactica: Blood and Chrome, about young William Adama's experiences in the first Cylon war. Although Caprica was occasionally uneven, it truly was brilliant at times and it tackled topics like virtual worlds and religious fanaticism that are rarely treated with any subtlety on television. It separated itself from the standard scifi television fare in other ways too. The series depicted a retro-futurist world, blending 1950s styles with far-future technologies. And it had a female mad scientist as its protagonist: Zoe, the young woman whose inventions helped create both the cylons and the possibility of virtual life after death. I think in a decade, we may look back at Caprica as a show that was ahead of its time - and cut down before it had a chance to fully realize its dark, weird vision of a world on the edge of inventing artificial life.